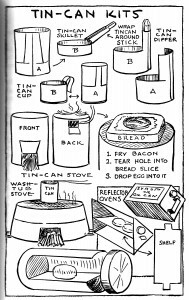 Classic Camping, like Steven Watts and David Wescott do it, requires assembling a camping outfit circa 1900-1930. You’ll be sleeping under canvas, wearing woolens, using point blankets, and cooking over campfires. When you camp like this, just any knife won’t do. You’ll want to carry something that would have been seen in the kits of the day. 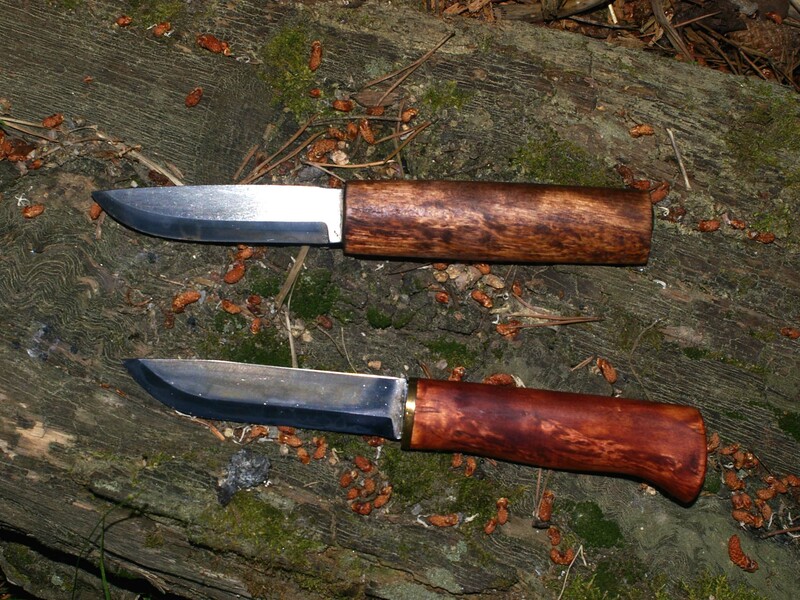 Until a just a few years ago, you could buy a Marble’s Ideal or Woodcraft and carry a knife largely unchanged in appearance since these classics were introduced in 1898 and 1916, respectively. 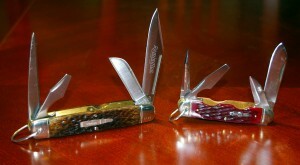 Not only that, both models were among the top three most recommended knives of the period (the other being the Marble’s Expert). 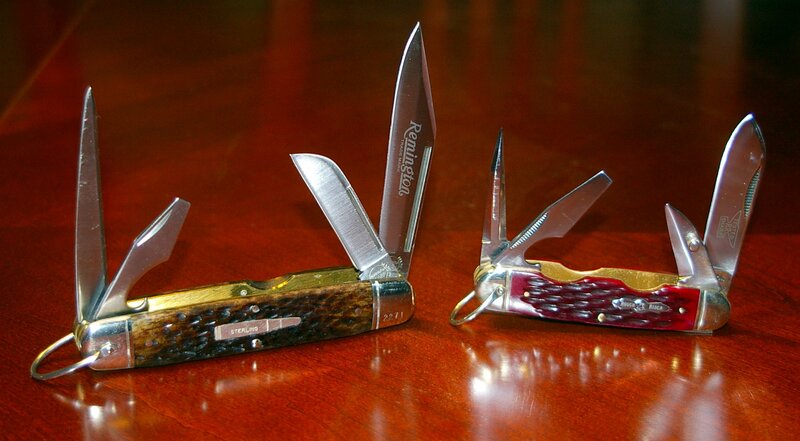 Sadly, Marble’s is now just another formerly-respected brand name, applied to a line of Asian-made knives that have nothing in common with the works of art that came out of Gladstone, Michigan. In late 2011, I discovered that Bark River Knives had introduced this 2011 Custom Canoe. It is a perfect re-creation of an original Marble’s model. For those not familiar with the Marble’s Canoe, it looked much like the Ideal but was offered only with a 4 1/2- inch blade whereas the Ideal was produced in 5, 6, 7 and 8 inch blade lengths. The Canoe was also made from thinner stock and featured a slightly different fuller groove and clip point. The differences are so slight that Canoes are often mistakenly identified as Ideals. The Canoe was produced from 1904 till 1923, smack dab in the middle of the Classic Camping age. From what I understand, the knife was a custom order, commissioned by Jason Thoune, the owner of DLT Trading. Jason wanted Bark River to re-create a classic Marble’s-style knife and that’s a good thing as Marble’s no longer makes the knives that built their reputation. A run of 100 Custom Canoes were produced, with a few going to a select Bark River dealers. The blade was crafted from traditional 1095 steel that was just under 3/16ths thick, which gives these knives the look, weight and feel of the vintage Canoes. Each and every blade was hand ground and the handles were all hand shaped. Handle choices included leather, Sambar Stag, buffalo horn and sheep horn and in combinations such as leather/Sambar Stag/leather with Sambar Stag pommel, Sambar Stag with Sambar Stag pommel and leather with Sambar Stag pommel. Bark River also made some synthetic Micarta handled versions as well (a mistake on such a period style knife in my opinion, but I’m sure some liked them). The original Bark River announcement for the Custom Canoe stated that they were planning to make “all of the sizes over the next year or so from the 4.5 all the way to the full size 8 inch blade version.” There was also a lot of discussion about this being the beginning of a new line of traditional knives, giving the impression that Bark River was going to re-create the Woodcraft and perhaps the Expert as well. Sadly, it appears that the plan didn’t unfold. By the end of 2011, DLT Trading was discounting the knife as sales were sluggish. According to Thoune, the decision to use traditional (old-fashioned) 1095 steel instead of the very popular CPM 3V powdered metal “super steel” currently being used by Bark River, was the main reason. If that’s the case, some folks made a real mistake in not buying one of these beautiful traditional knives. For those who might discount the Custom Canoe because of its old-fashioned look, don’t be fooled, this knife will perform as well as any knife out there (no, the 1095 won’t hold an edge like some of the modern “super steels” but a quick strop on a piece of cardboard or your jeans will keep it razor sharp). 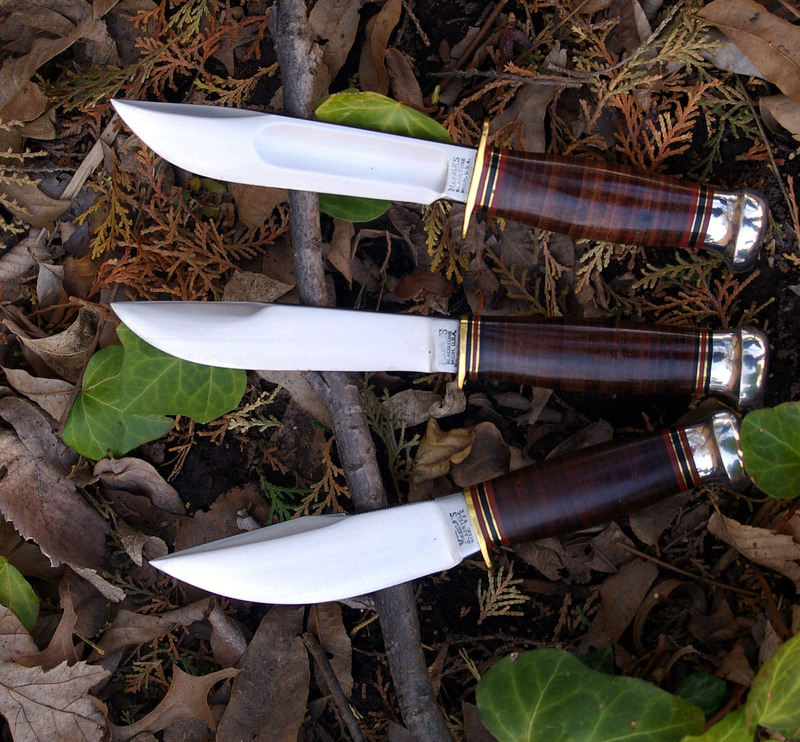 Like the majority of Bark River’s products and all of the good Marble’s knives, these blades are convex ground. The convex grind puts more steel behind the edge and makes this more durable than any other knife grind. This is a knife you can depend on in the toughest situations. The Custom Canoe is also a better knife than a vintage Marble’s. It’s tempered harder and the overall quality, fit, and finish is better than production Marble’s knives. The handle is also sized to better accommodate today’s hands (vintage knives had very short grips as hands were smaller a century ago). I also prefer the thinned blade over that of the Ideal. Note: being thinner than an Ideal’s blade does NOT mean this is a particularly thin blade, the spine is still very stout. 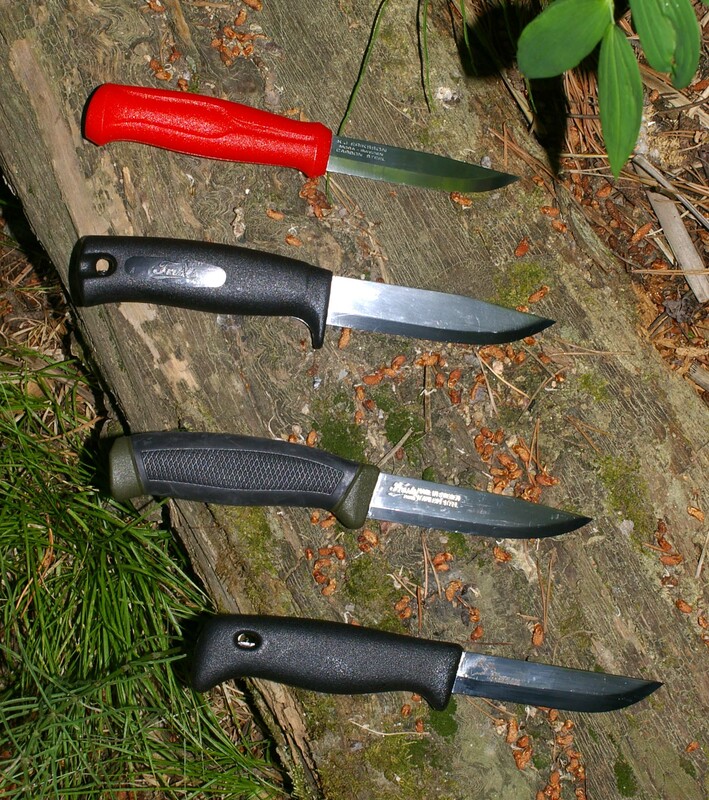 Of course, you may find a particular type of knife to be more appropriate for a specific use (I wouldn’t use this as a fillet knife), but for an all-around outdoor/camp knife, you’d be hard pressed to find something better. This knife will do the job and then some. The only thing I was not jumping-for-joy pleased about was the modernized sheath. Now, vintage sheaths leave A LOT to be desired. None I’ve encountered secured the knife very well and most Marble’s sheaths were rather thin and flimsy. 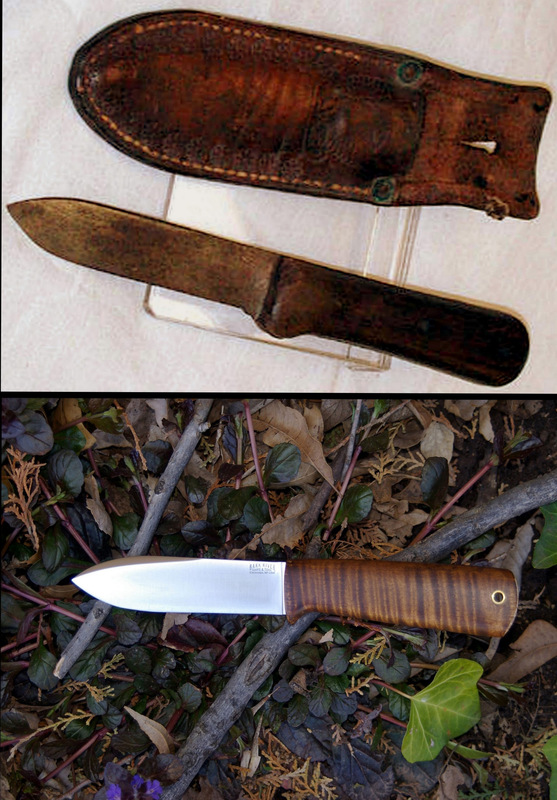 So while I would not offer a replica of the original sheath, I wish Bark River would have chosen a style with a more vintage look. Still, this is a middling complaint and in no way changes my opinion of this being the perfect “Classic Camp” knife. Does all of that rustic perfection come cheap? Nope. 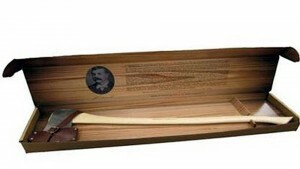 Depending on the handle material, the Custom Canoe costs between $235.00 and $250.00. Luckily, some of these knives are still available if you search on the Internet. My feeling is once they are gone; this style of knife will likely not be seen again. If you are a Classic Camper – get one while you can! It’s unlikely that you’ll find any ax, contemporary or vintage, having all of the desirable characteristics listed in my last post but there are some real jewels to be had out there if you know where to look. In the past, you could choose from dozens of ax models from many different ax makers. And nearly every maker offered at least one line of truly fine axes. Today, the number of high-end makers can be counted on one hand. And that’s considering the global market, not just the United States. Or, you can restore a vintage axe. Many folks consider them to be better made than what can be purchased today. And while it’s true that a lot of inexpensive old ax heads can be found at flea markets or garage sales, note that unless you have the skill to do all or most of the work yourself, a vintage ax, ground properly and restored, will cost you nearly as much as a good new one. Also note that a NOS (new old stock) vintage ax would still require proper grinding and shouldn’t be considered usable until that work is done. After grinding, convexing, and honing, you can easily maintain the edge but it’s difficult to significantly alter the profile of an ax without the proper equipment. If you want to go this route, check out the Tools section of Pole and Paddle Canoe, Owner Don Merchant often has a few old axes on hand for sale and he is very knowledgeable. He won’t sell a bad one. Old or new, I generally send my axes to Bark River Knives for the grinding and initial convexing and any head clean up (I always ask that they give the head a satin finish). 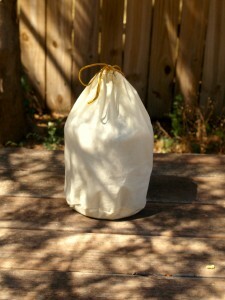 The price will vary on how much work they need to do but figure around $40.00. So, if you find an old ax head for $10.00, it’ll end up costing you around $70.00 for all the work and purchasing a good handle, assuming you’ll hang it yourself. The Council Tool Velvicut Premium American Felling Axe (Item # JP40DV36C – 4 Lb Felling Axe with 36” Curved Handle – $170.00) was introduced in 2011 as the first model in an entirely new line of high-end axes. The Velvicut name has been resurrected from Council Tool’s best axe line of half a century ago. The Velvicut line was originally introduced to compete with the top of the line Plumb and TrueTemper axes of the day (the Plumb “Dreadnaught”, Kelly “Perfect” and “Flint Edge” axes most likely). 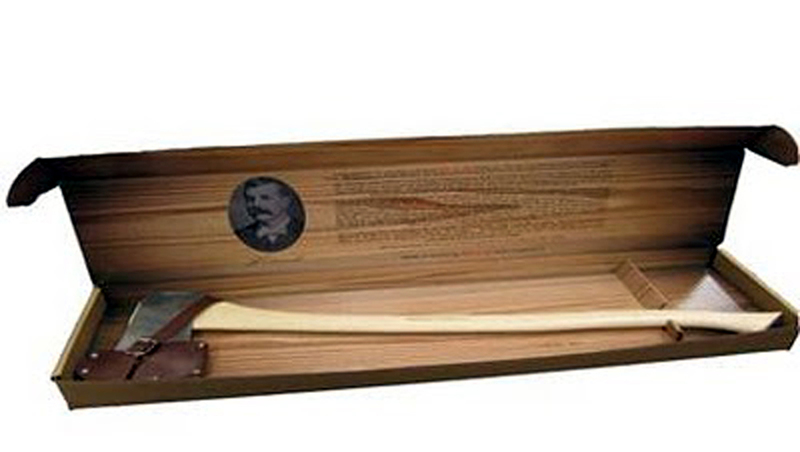 The Felling Axe model was followed up by the Velvicut Premium Hudson Bay Axe (Item # JP20HB24C – 2 Lb. 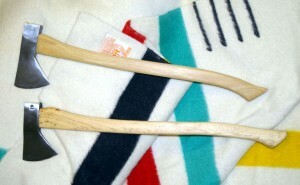 Hudson Bay Axe with 24” Handle – $130.00) in October of the same year. I was a bit surprised and a might disappointed to learn that the first model out of the gate was a felling ax. With a four pound head and 36” handle, it is nota sporting ax and should not even be discussed among camping axes here. 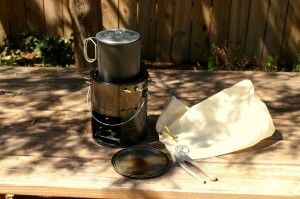 However, Council’s effort to produce a very fine American made ax was a start and I was buoyed by the idea that it might be followed up by a model more appropriate to camping and wilderness use (at the time I did not know when the Hudson Bay model was going to be produced and actually expected it to be a year or more later). I was very pleasantly surprised to get a call from Council Tool saying that the Hudson Bay axes were boxed and ready to ship in late 2011. 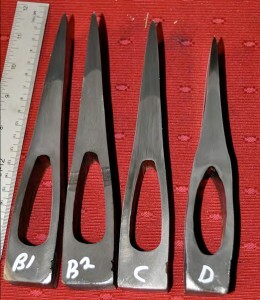 Above: Velvicut ax heads are compared to the competition. 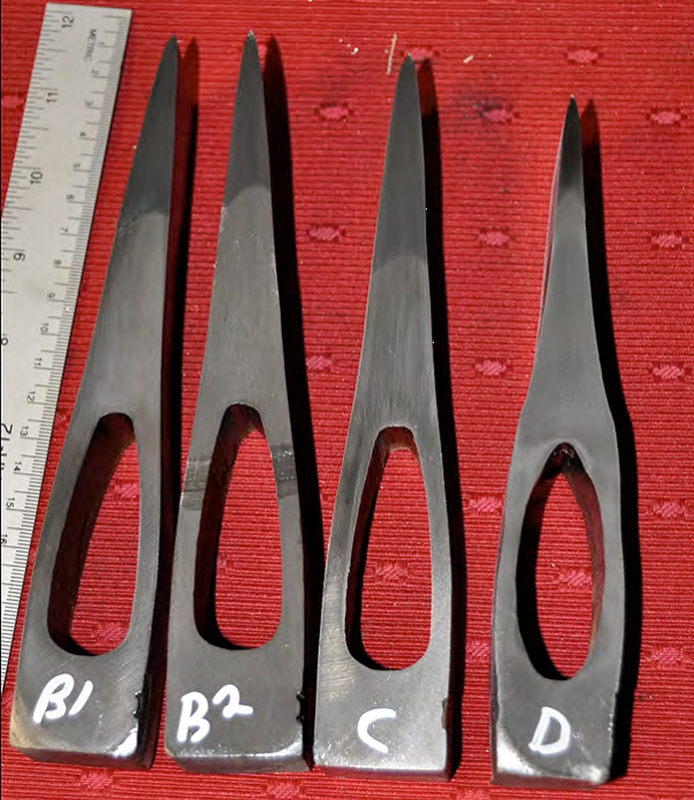 Three Velvicut heads were sectioned and analyzed by an independent lab for depth of hardness against that of a competitor. Heads marked B1, B2 and C are Velvicut heads. The head marked D is a competitor. The Council axes are through hardened from 1.75” to 2.00” back from the bit. The competitor’s ax is hardened only about .75” deep. Photo used with permission of Council Tool. Council Tool graciously sent me a pre-production Velvicut Felling Axe for evaluation. The version I was sent was a very early example and while I found the head profile to be excellent (the ax threw chips like a dream), all was not perfection. I had a few minor to moderate criticisms of the ax. The head was not ground symmetrically, being thicker on one side of the eye than the other. It was also slightly misaligned on the handle. And while I loved the shape, diameter and finish of the hickory handle, though the graining was acceptable, it was not straight. Though the type was not what I wished for, my experience using the ax left me very impressed with its look, feel and performance. To be sure I had quibbles but it was also superior to the standard grade Council Tool axes I own or have seen. It also had very good temper. A hardness test (running a file over the edge, toward the poll as if sharpening, showed that the steel was hard enough to hold an edge while not being as difficult to sharpen as some Swedish axes I own. I found the balance to be excellent as well. I submitted my critique to Council Tool and to their credit, all of my criticisms were corrected in production. In fact, the ax eventually produced was so improved and so different than the example I was sent, it is not fair to provide an evaluation of the felling axe here. I plan to purchase a production model in the future to give the model a proper test. In addition, Council Tool provided me with one of their Velvicut 2 Lb. Premium Hudson Bay Axes for evaluation just prior to delivery and found it to be superb. Until I post an evaluation, just watch this video of how the Hudson Bay axe is crafted and see it in action here. More will be posted about this wonderful axe in the near future! Other American brands include Vaughan and Bushnell and Barco Industries (now owners of the venerable Kelly name and makers of the Kelly “Perfect” and “Woodslasher” axes but sadly, i hear that the Kelly name is being retired). That’s it. Snow and Nealley axes are now assembled in the US but are no longer forged here (more about this brand below). Everything else is made offshore or in Mexico to my knowledge. Two Pocket Axes: The Gransfors Bruks Mini Hatchet and the now discontinued Bark River Knife and Tool Mini Axe, a modified Vaughan hatchet. A Karesuando Raven Scandi blade knife is in the center. Although pocket axes are currently very popular, their usefulness is limited by their light weight. These aren’t chopping axes. 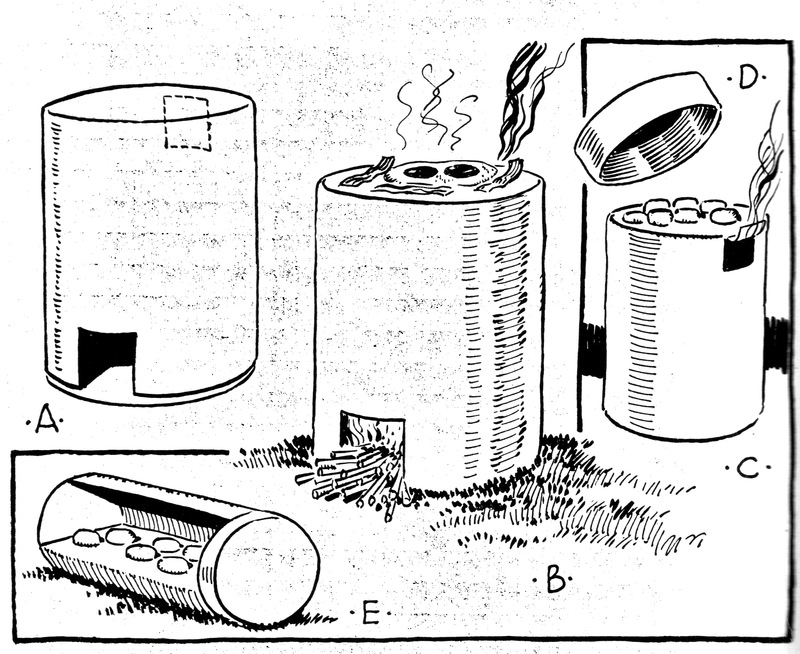 They’re primarily used to split kindling from small-diameter logs by striking the poll with a log baton. 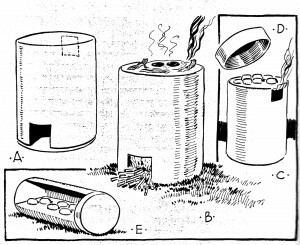 In this manner these toy-like tools will produce kindling faster and more efficiently than a knife. Currently there are two pocket axes on the market: the Vaughan “Supersportsman Sub-Zero Axe” (8 oz. head, 2 ¼ inch bit, 10-inch handle, 11.5 oz. total wgt, $17.00-$30.00) and the Gransfors Bruks Mini Belt Hatchet (8 oz. head, 2 ½ inch bit, 10 ¼ inch length, 12.01 oz. wgt. $145.00). The Gransfors Brukshatchet is abeautifully crafted ax that’s delivered razor sharp and is tempered to really hold an edge. The 2 oz. weight increase over the Vaughan gives the Gransfors ax more heft and puts it in the same weight class as Kephart’s original Colclesser hatchet. The extra head width also provides for a larger eye allowing a larger diameter handle to be used. 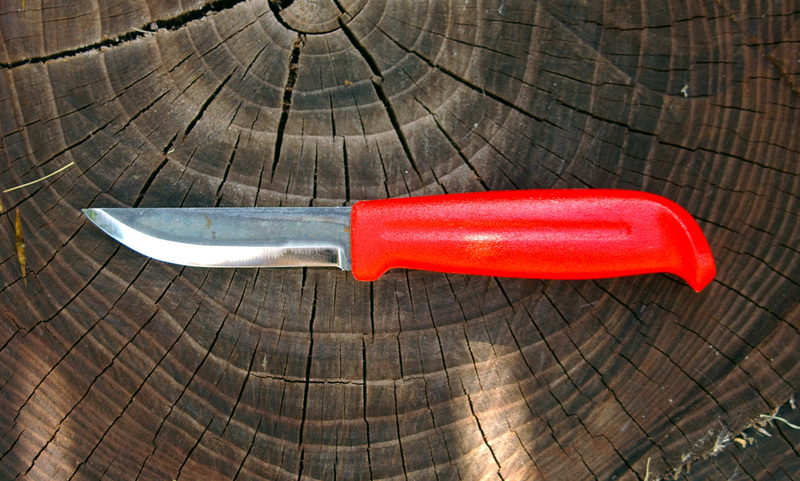 This makes the Mini Belt Hatchet a stronger tool than its competitor. Older Vaughan hatchets featured thicker profiles than today, which made them possible to reprofile. 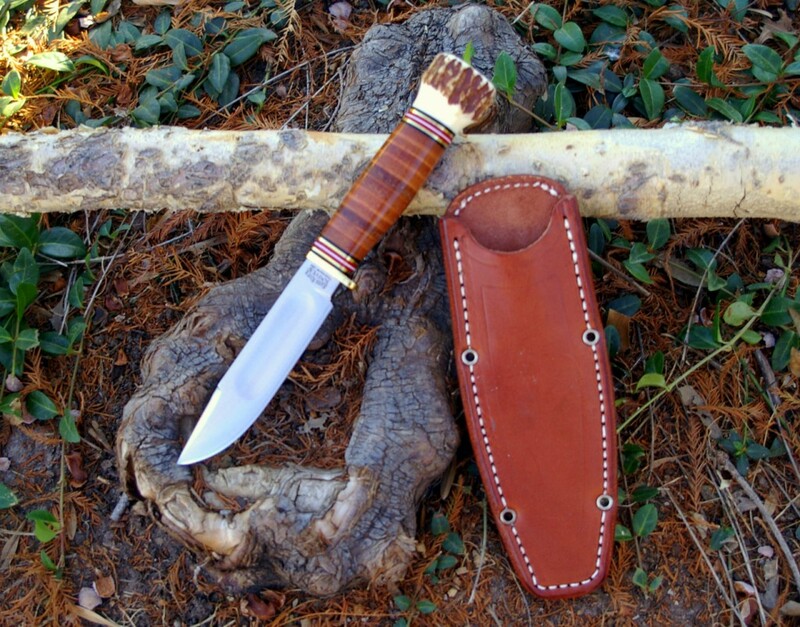 That was done by Bark River Knives, who modified the Vaughan to create their Mini-Axe a few years ago. Here is a discussion of pocket axes, including a review of the Vaughan hatchet and the modifications made by Reid Hyken, which later became the Bark River Mini-Axe. When Vaughan changed their die and thinned out the head profile, Bark River could no longer modify the ax and dropped that model. I own an unmodified, old style Vaughan hatchet and the now discontinued Bark River Mini-Axe. No question but that the Mini-Axe dramatically outperforms the regular Vaughan hatchet. Though I like the Vaughan and Bark River Mini-Axe I’ve come to use the Gransfors Mini Hatchet more often because of the greater head weight. It’s too bad that there aren’t more pocket axes made in a similar weight but with profiles like the Bark River Mini Hatchet. Both Gransfors Bruks and Wetterlings also offer a small hatchet of around 11-inches in length with a 1 lb head. The Wetterlings was the first with one of these on the market and it has become quite popular. However, no ax with a head weight of one pound can be considered a true pocket ax. Heavier but far more efficient than a pocket ax. Hand axes (approx. 5 1/2″ head, 2 3/4″ bit, 1¼ to 1 ½ lb. total wgt.) are often called Scout axes due to this type’s long association with the Boy Scout program. Axes in this size are stocked in far greater numbers than other types and are typically the least expensive of axes. This is a great size of ax to start with and most folks will never need anything more. The Boy Scout catalog continues to list hand axes, the Swedish companies make hand axes, and domestic companies such as Council Tool (Hunter’s Axe #125HU), 1 ¼ lb. head wgt., 14″ total length, $34.00) continue to make them in America. 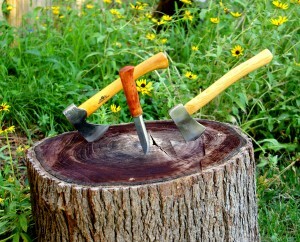 Gransfors Bruks crafts the very nice Wildlife Hatchet Model #415 and Wetterlings, the Wildlife Hatchet #106. Husqvarna makes the wonderful Hatchet, described in a previous post, which sells for only 41.00. It makes me sad to report that while the Snow & Nealley company of Brewer, Maine has been a long respected ax manufacturer, reccent reports indicate that their quality control has declined and they are now having their heads forged in China. My experience with their “Young Camper’s Belt Axe” #o14S was not entirely positive. The ax was tempered too soft to hold an edge and the quality was not up to par for as much the ax cost. For an ax that retails in the same range as some of the Swedish axes, they are not as well finished or as well tempered and the slick varnish on their handles must be removed. Mine also had a large gap between handle and eye that was filled with wood putty. This was painted over with paint (also applied to the head) which served to disguise the defect. Because of their quality control issues and their exceedingly soft temper, I cannot recommend a Snow & Nealley ax at this time. I honestly have not tried the Council Tool #125HU but know that it is a made-in-USA tool of good temper. A couple of years ago I discovered the inexpensive Sears Craftsman Model 48101 1 ¼ lb. Camp Axe ($16.99) at my local Sears store. Frankly, I was amazed at how nice this little ax looked. In size, weight and appearance it was much like the Snow & Nealley but of higher quality. 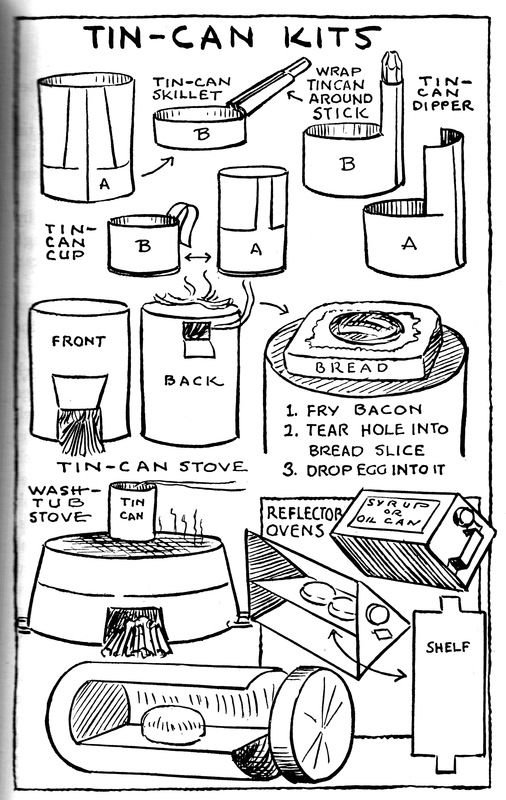 My example is an earlier version of the current Sears Camp Ax. Mine has the brand name, model number, head weight and “made in the USA” stamped in the head. Current models feature just the brand name and model number laser etched on the head with no mention of where the ax is made. I was immediately struck with the Craftsman’s high quality features and appearance. 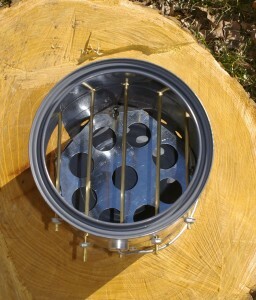 The head was clear lacquered raw steel with satin finished faces (the top and bottom are left roughly ground). The handle was of white hickory (sapwood). Of several on display, all featured perfectly mounted heads fitted with a wood wedge, showing no gaps whatsoever. This was in marked contrast to the Snow & Nealley I own. Handles were stained dark reddish brown and finished with a slick, clear coating (which must be sanded off and refinished with raw linseed oil). Of the six examples I examined, two had perfect graining and edge-to-handle alignment. They were the best grained and aligned hardware grade axes I’ve seen, bar none. The remaining four (all etched versions) had near perfect graining but two of those had heads that were very slightly misaligned. The profiles seemed good but edges were not particularly sharp. Sharpening proved that these are well tempered and would keep an edge but after testing I discovered that profile is too thick overall and must be really thinned down to improve performance. This thickness is throughout the cheeks and into the edge and so, would be too much work to alter with hand tools. The ax needs to be professionally reprofiled. I’ve put the Craftsman away until I can send it to BRKT for some serious work. Unfortunately, that means the Craftsman ax is not the bargain I thought it would be. After the reprofiling it would approach Swedish ax prices. Too bad. Nessmuck style hatchet by Lee Reeves of Shattuck, Oklahoma. A superb ax. Another choice in hand axes is a double-bit pattern. 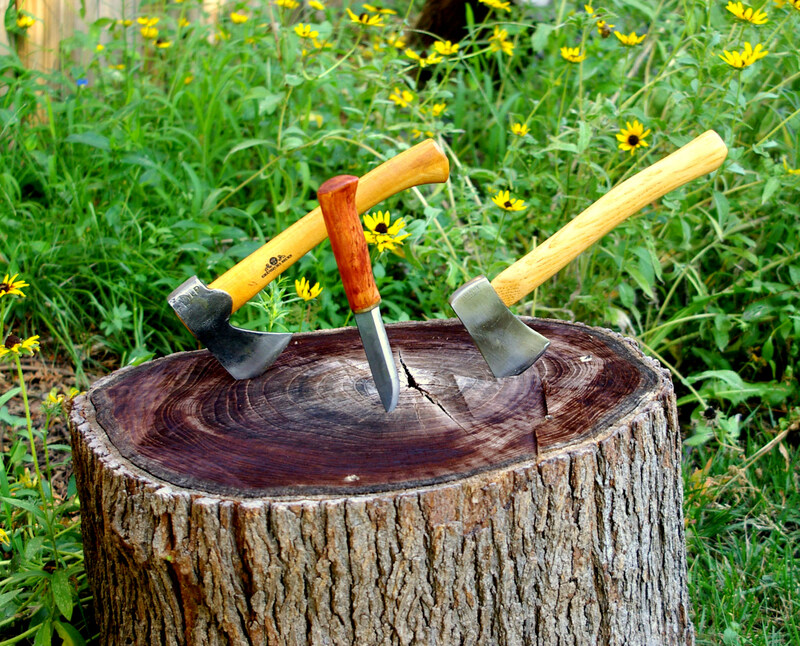 The double-bit hatchet, as described by Nessmuk in Woodcraft (1881), has intrigued generations of outdoorsmen since he first touted its utility nearly 130 years ago. Because the weight of the head is equalized by the two bits, balance is superb, making it an absolute joy to use. Double-bits also make good winter axes because if one bit breaks due to the cold, you still have a back-up. Those benefits however, are negated by the fact that you lose the poll, so valuable for pounding stakes etc. Double-bit hatchets are a distinct rarity today. You’ll never see one in a hardware store as they are sporting axes, and you’ll never see one in a sporting goods store as they are only known to the cognoscenti. Certainly, the most popular of the modern Nessmuk style belt axes is the handmade double-bit made by Lee Reeves of Shattuck, Oklahoma. His hand forged axes are made in the traditional manner, with hardened steel bits forge welded into a softer steel ax head. Reeves forges his axes using both a trip hammer and hammer and anvil. The axes are made like Nessmuk’s, with one bit ground thin for cutting clear timber and the other thick and stunted for cutting deer bones, knotty wood etc. Lee provides handles of ash, walnut, Osage orange, or curly maple at various costs. Head weight of the ax is about 1 lb., head dimensions are approximately 5½” long, handle length is 15-inches long. Wait time for one of these fine axes is running one year. Lee’s website has changed considerably since the last time I looked at it. 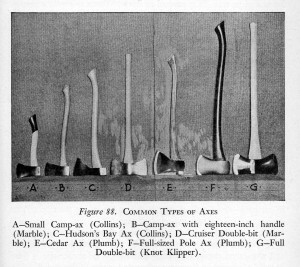 He used to show both single bit and the Nessmuk axes and showed the prices of every kind of ax/handle combination (the Nessmuk axes ranged in price from $165.00 to $205.00). Now he only shows a photo of the Nessmuk axes but no prices whatsoever. Contact him to determine current prices. If you desire a Nessmuk style hand axe, the Lee Reeves double bit is a beautifully made, perfectly balanced choice. Although Mason loved this type, others disagree about its versatility. 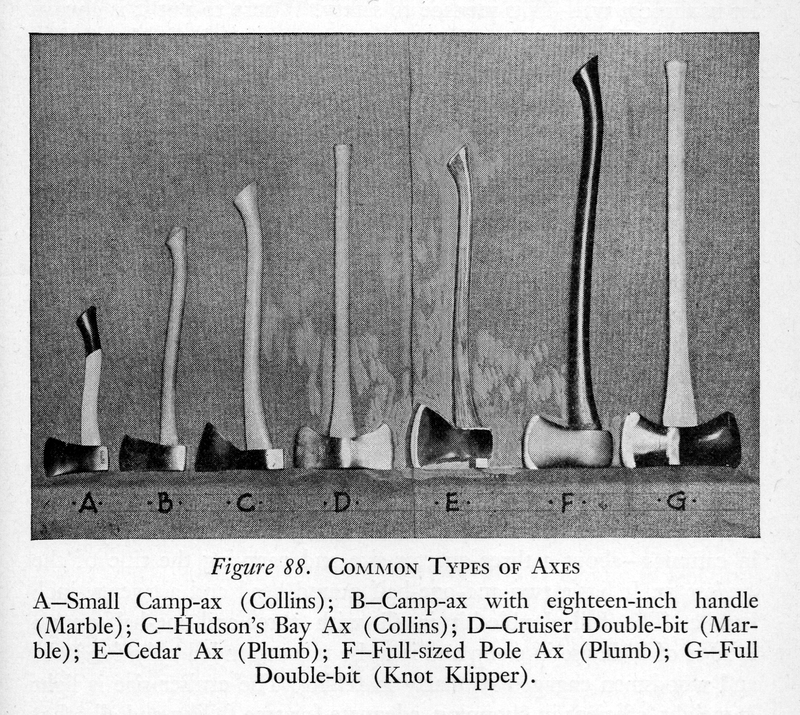 Critics note that the weight and size of these axes make them too large and heavy for convenient carrying, yet they also lack the cutting efficiency of the larger “Boy’s” ax. It’s all a matter of preference. The primary reason for Mason’s high opinion of the camp ax was his experience with a particular model ~ the Marble’s No. 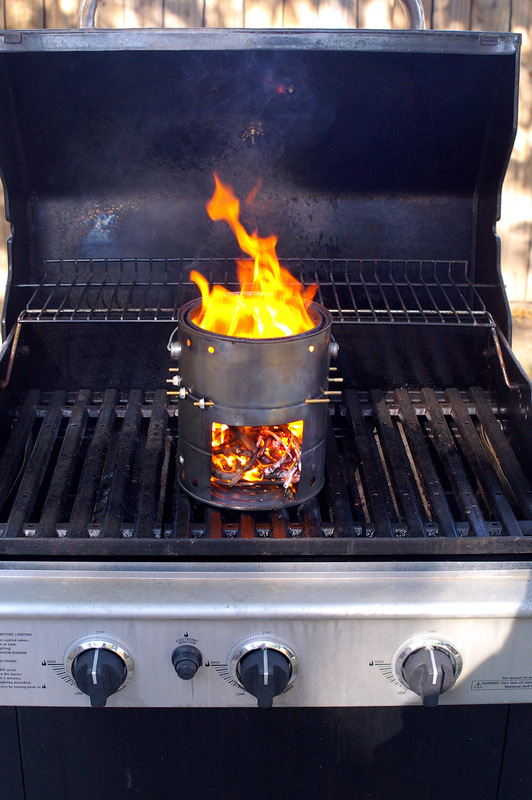 10 Camp Ax fitted with a 20-inch handle (18-inch overall length after mounting). The Number 10 was produced from 1906 to 1914 with a 1½ lb. head and from 1915 to 1943 with the 1¾ lb. head. A choice of 16, 20 or 24-inch handle lengths were offered for all years of production. Properly convexed and honed, the No. 10 will outperform any camp ax made today. Its only design flaw was the small-diameter handle. Number 10 Camp Axes are extremely difficult to come by, and when found, the handle is usually broken. In good shape, they are a collector’s item, commanding very high prices. Too bad no manufacturer produces a modern version of this ax with a slightly wider head/eye and thicker handle. It would be the perfect camp ax. The modern axes in the same general size and weight range are the Gransfors Bruks Small Forest Ax (1 ½ lb. wgt, 3 ¼” bit, 19″ handle) and the Wetterlings Outdoor Axe #118 (1 3/4 lb. wgt, 3” bit, 19″ handle) At this time, Husqvarna produces no similar model. The ax of explorers, voyageurs, trappers, and traders. 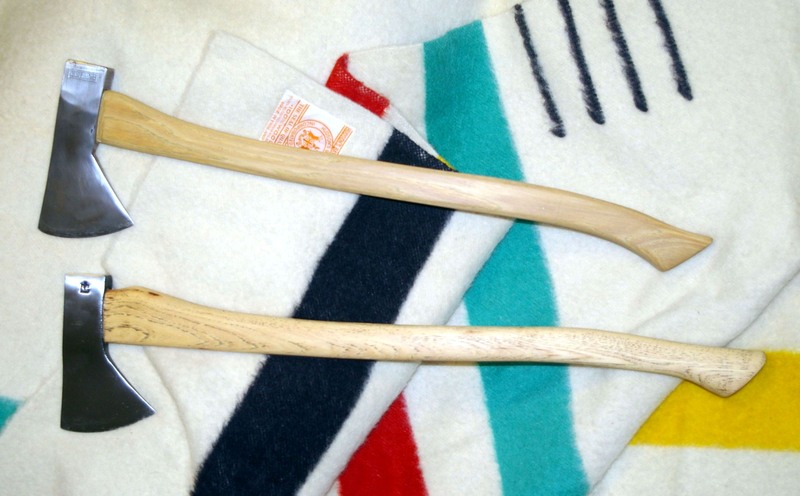 The Hudson’s Bay pattern descended from the trade ax/tomahawk of the 18th century and is the traditional ax of the North Woods and Canadian Shield. Highly popular among native tribes and those who work, live and travel in remote wilderness, the pattern has both devotees and detractors. 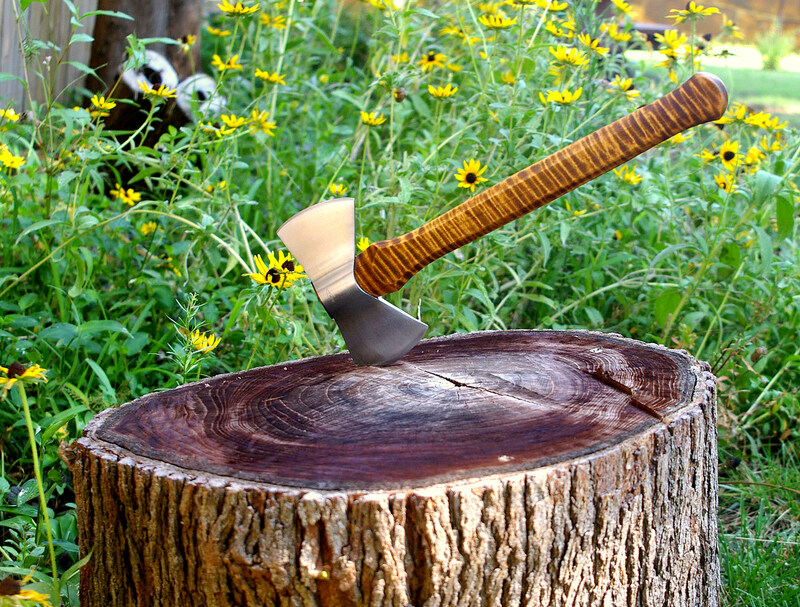 Critics complain that the corners of the axe’s prominent beard are prone to breakage, particularly in cold weather, and that the design isn’t an efficient chopping ax. Enthusiasts counter that it was never intended to be a woodlot ax but rather, a wilderness ax made for light, fast travel. They also point out that it excels at shaping wood, a common task of remote wilderness living. Bear in mind that because “Hudson Bay” refers to an ax pattern rather than a size, a wide range of weights and lengths exists. 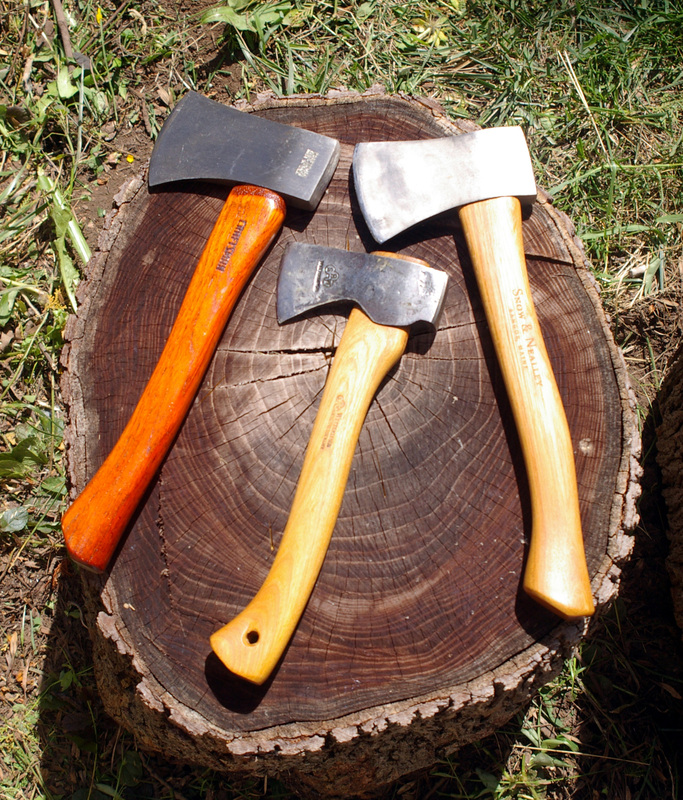 While hatchet-sized versions are often found, the ax typically considered a Hudson Bay is one fitted with a 24” to 28” handle. It’s a widely shared opinion among knowledgeable users, that the finest American Hudson Bay axes ever produced were made by the O. A. Norlund Company. Sadly, Norlund axes disappeared sometime between the late 1970’s to mid 1980’s. As they were made up until relatively recently, it’s not uncommon to see new old stock examples still in the package turn up on eBay. These now go for up to $200.00. Luckily, nice used Norlund heads can be had for $50.00 or less, making it possible to have a very nice Hudson Bay ax at a reasonable cost. A popular American-made Hudson Bay axe, currently in production, is the Council Tool #17HB18 (1 ¾ lb. head, 4-1/8″ bit, 18-inch handle) and the #175HB28 (1 ¾ lb. head, 4-1/8″ bit, 28-inch handle). Council Tool advertises the length of the handle before hanging, thus the 18″ model has a handle of 16 inches and the 28″ model has a handle that actually measures 26 inches. The Council Tool axes are well tempered and are fitted with lightly waxed handles. However, they are a utility grade tool and suffer from the occasional misaligned head and/or poor graining. Yet, with careful selection they make good wilderness axes. I own one that Bark River worked their magic on and it is an excellent Hudson Bay ax. Of course, the recently introduced Council Tool Velvicut Premium Hudson Bay Axe, model # JP20HB24C has eclipsed all other Hudson Bay axes on the market (See my review of ths axe). I have to agree with Cal that this size and weight of ax is dangerous and should not be recommended to a beginner as a first ax. Yet, in modern outdoor recreation, no full sized ax is useful. All of the axes that would be carried for outdoor activities are short and thus, should be used with the same caution. Remember, you can produce a much more powerful swing with these than a small camp or hand ax – but you can easily strike yourself with a miss – so learn your onions and spend some time practicing. As for recommended models, the most popular ax in this size is the Gransfors Bruks No. 430 Scandinavian Forest Axe (2 lb. wgt, 3 ½” bit, 25″ handle, $118.98). Wetterlings makes a very similar axe (Scandinavian Forest Axe #121), 1.9 lb. wgt, 3 ½” bit, 26″ handle, $79.98). Another ax to consider is the Bahco HUS-1.0-650, a super value for the money. Bahco (now owned by Snap-On Tool), a Swedish company established in 1886, produces a large selection of drop forged, German-made axes. The company regrettably switched the handles used on their “Top Range” axes from select hickory to a choice of fiberglass or ash. The ash handled models feature fully polished heads and a soft-grip orange elastomer coating on the bottom of the handle. Their “Standard Range” axes feature painted heads and come fitted with ash handles that are coated with thick textured paint on the bottom. 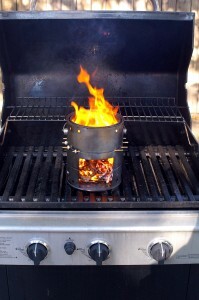 In my opinion, the ash handles are a reasonable tradeoff for an otherwise very high quality product. Their Standard Range ax: Model HUS-1.0-650 and Top Range ax: Model HUS-1.0-650SGfeature a 2 ¼ lb. head, fitted with a 26-inch ash handle. As delivered, the HUS-1.0-650 features a painted head, a handle garishly marked with the Bahco logo, application pictogram, product code, and a barcode, applied over a gloss coating, with the thick paint applied to the bottom fourth of the grip. 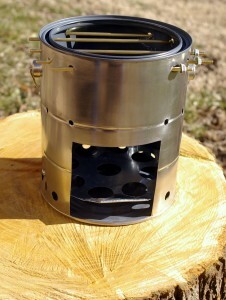 The wedge is made of carbon fiber that features an integral hanging loop. The profile is good but the factory edge is not fully convexed. However, craftsmanship is excellent and of the examples I’ve seen, nearly 50% are straight grained and all had aligned heads. While it would be nice to have someone grind the head a bit and properly convex and hone the edge, at an average retail price of between $28.00 and $39.00, the added cost for the improvements would add up to more than the ax is worth. However, if you desire a relatively inexpensive ax that works, then look no further. With the bit convexed, the edge honed, the hanging loop sawed off and the head and handle refinished, the HUS-1.0-650 makes a very good wilderness ax. Husqvarna recently introduced their Forest Axe (approx. 2.25 lb head, 26″ handle) and it looks very nice indeed. At only $63.00, it may soon be my Bahco replacement. Council Tool makes the #22BR Council Pro Boy’s Axe (2 ½ lb. head, 28″ handle), which also appears to be a high quality tool but will take some careful selection and work to get it into proper shape. Still, it only costs around $35.00 and would be worth the work if you can find one with good graining and alignment. Hopefully, Council Tool will produce a Velvicut version of this model in the near future. There you have it – a list of several ax models from various makers that are perfect for woodcraft camp use. Now go find yourself an ax to grind!